Download complete websites to your desktop and surf them offline. Website eXtractor saves you time and effort by downloading entire Internet sites (or the sections you stipulate) to your hard drive. Whether you browse the web for research, work, or fun, there’s nothing worse than having to wait for page after page to load in Internet Explorer or Netscape Navigator (or in other popular browsers). The problem is they will only load one page at a time. So if you are viewing a large website with a thousand pages, you’d have to click the mouse a thousand times … and … choose a directory/folder a thousands times when you want to save each file. You end up spending a lot of time waiting around and not enough time reading or viewing pages on the Internet. Note: Using a regular browser to surf large websites or photo galleries takes the fun out of web browsing and makes research a real chore. But now, with WebSite eXtractor, you can download whole websites (or parts of them) in one go to your computer. You can then view the whole site offline at your leisure – and you can whiz through the saved pages at lightning speed. 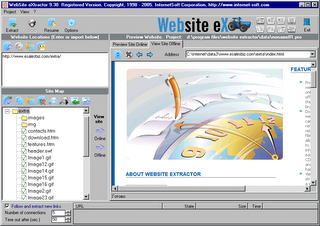 WebSite eXtractor is a great tool for researchers, journalists, students, equity analysts, business and marketing executives – as well as for those who want to browse family websites containing digital photo albums. Another big benefit of the program is it changes html-links to relative names. In other words, it turns web addresses (URLs) into addresses that work on your computer. Researchers, writers, and journalists can easily archive reference material from the Internet. The program can download up to 100 files at a time, which saves you a huge amount of time compared to ordinary browsers. Website eXtractor automatically lets you download any files that were not copied due to transfer errors or bad connections. Here are the most popular free Antivirus available to download.